I have been thinking about peanuts a lot lately. (I know, random.) First and foremost, I've been craving honey peanut butter. Also, Hannah is 21 months old and she eats just about everything except peanuts. We haven't given them to her yet, per our pediatrician. She seems to think that, should she have a reaction, Hannah will be able to handle it better when she is older. (Thus far, she has no allergies that we know of.) So we've been advised to wait until she is two. But, seriously, peanuts are so good. And since I love them so much, I'm dying to see if she likes them, too. I know that some pediatricians don't advice the waiting game. And I've done some research online. So I'm currently toggling between just going ahead with it and waiting until January when she'll be two. But does three months really make that big of a difference? Truth: I'm nervous as hell to give them to her. What if she reacts in a way that's not "more, peeeze!"? Anyway, aside from them being so good, peanuts are also so good for you which is another reason I want to add them to her diet. Variety is the spice of life, so the more I can give her in terms of healthy eats, the better! Let's talk about why peanuts are so good for you. 1) MANGANESE: Carbs are our main source of energy, and this stuff helps burn 'em. 2) PHOSPHOROUS: Got teeth? This stuff supports good tooth health. 3) PROTEIN: Ahh, yes. A staple in every diet. Muscle up! 4) DIETARY FIBER: Good for the 'ol digestive system. 5) VITAMIN E: We are essentially giant bags of cells, and cells need E.
6) MAGNESIUM: Muscles move bones, and bones need this stuff. Mr. Peanut, man. He's been around for awhile now. Update (10/02/13): I gave Hannah peanut butter on Sunday. I spread just a bit of it on one corner of her toast at breakfast. She didn't have a single reaction, so I took it one step further on Monday by adding even more to her toast. And on Tuesday, she ate her first PBJ. Needless to say, no allergies in this house. But really, that's only a small portion of why I'm thrilled. Girl loves her some peanut butter. It's one more healthy food that I can add to her diet. As I type this, she's chowing down on an apple. Don't get me wrong, she loves herself some fishie crackers, too. But so far, there's little she won't eat—which makes it easy for me to help her eat healthy. I realize she's just shy of being a two-year old, and I realize her culinary adventures can and will probably stop and/or slow down at some point, but for now I'm thrilled. I'll soak up every minute because (let's be honest) it makes it so much easier for me to grocery shop when I can give her anything and everything I eat. Like, for example, Nature's Tiny Miracle. Ha! 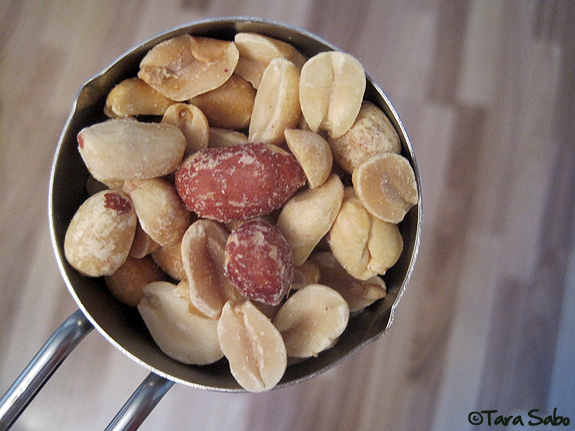 Question: Parents, how did you test peanuts with your little ones? Question: How do you, dear readers, incorporate peanuts into your healthy diet? We gave our son peanut butter around his first birthday (when we started giving honey and all the other tricky stuff). No one in our family is allergic and neither is he. He eats peanut butter on bananas and on sandwiches as well. I've also given him almond butter and he likes that, too. I sometimes give him a gob on a spoon, but I've been told that's a choking hazard to kids (so far, he's been fine). I tried to give him nuts once, but he about choked on even a small piece, so I would save the whole nuts for later. Just my two cents! I love peanut butter on bananas! I'll probably just take the toast route when I give it to her...girl loves her toast! All of them are necessary for us especially when it comes to getting the amount of substences its our need.What you have written makes sense and highlights the basics i am glad to see it mate. Up next: Fall fitness plan.